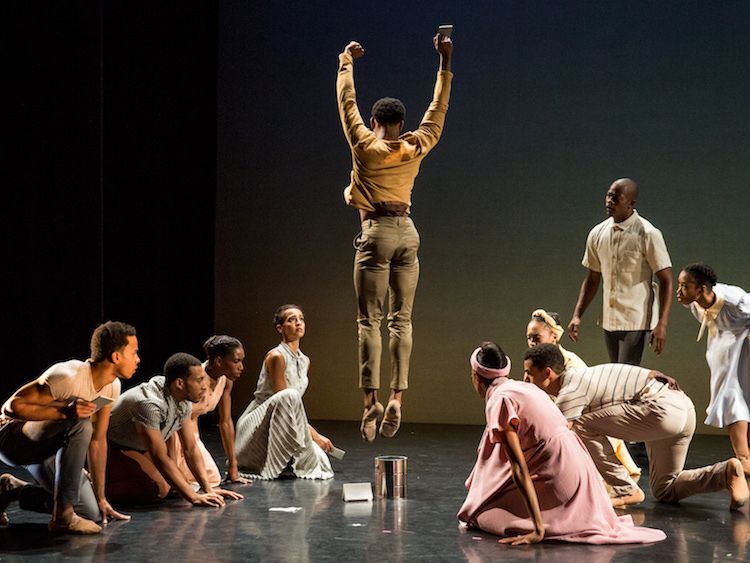 Jeremy McQueen's Madiba is part of the Kennedy Center's Ballet Across America, a weeklong series illustrating the nation's most creative and exciting dance, curated this year by Misty Copeland and Justin Peck. Jeremy McQueen was introduced to ballet in the 7th grade while attending a performing arts middle/high school in San Diego. Bullied and teased for his weight, high-pitched voice, and the way he dressed, he was given the choice of taking P.E. or dance to fulfill his physical education credit. Not having much in the way of athleticism, and tired of changing for P.E. in the bathroom stall, McQueen eventually went with dance. He hated it at first, and hated wearing tights and a dance belt, but his dance teacher, who was also black and male, encouraged him to stick with it. 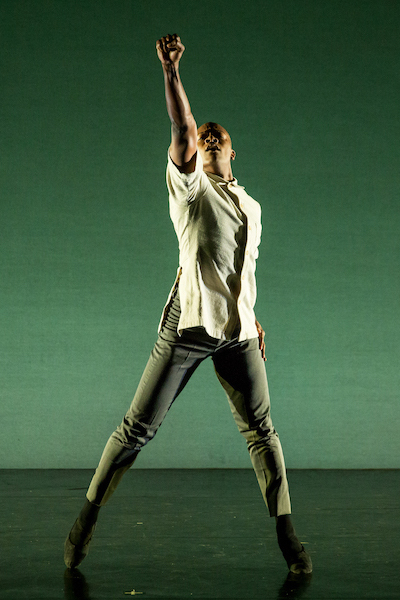 McQueen credits being exposed to other black men in dance—such as Desmond Richardson and Eric Underwood—for inspiring him, though there were very few men of color, particularly openly queer men of color, when he first got into ballet. That, however, is slowly changing. McQueen is the founder of the Black Iris Project, a ballet collaborative that's putting on a ballet about the life of former South African president and noted Naomi Campbell mentor Nelson Mandela. Madiba, the 25-minute ballet based on an original score by Carman Moore, follows the life of Mandela from birth to death. It's being presented as part of the Kennedy Center's Ballet Across America, curated by dance-choreographer Justin Peck and national treasure Misty Copeland. Here, McQueen discusses his inspiration for Madiba, queer men in ballet, and how the art form is becoming more diverse. OUT: Tell me about the Black Iris Project. Jeremy McQueen: The Black Iris Project is a ballet collaborative that brings together professional black ballet dancers from companies around the country, and black artists of various other mediums to create new ballets that are rooted in black history or the black experience. While growing up, the first ballet I was introduced to was The Nutcracker, based on a European fairy tale. I loved ballet because it was linear and not so abstract, but I saw very few classical story ballets that reflected my heritage and upbringing. So the mission of The Black Iris Project is to essentially be the change we wish to see in the world. 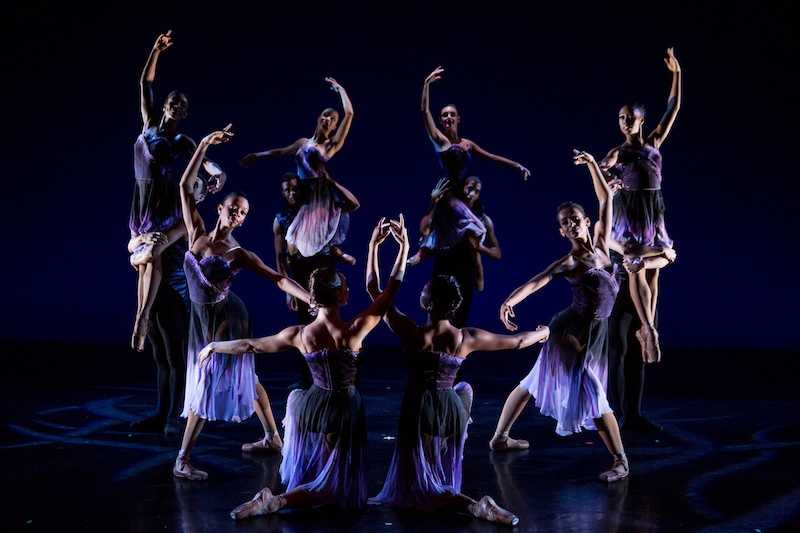 Often you'll see modern dance works such as Revelations that are rooted in black heritage and cultural tradition, but it’s extremely rare that you see a black ballet. Our ballets are not only rooted in black stories and history, but they are also created by a team of black creatives. Madiba for instance is the story of Nelson Mandela's life. The choreography, lighting design, costume design and music were all created by black men. ​My idea to create The Black Iris Project came after I had created my first classical ballet entitled Black Iris which was inspired by and in tribute to three strong black women who helped raise me. I created the work in 2013 as part of an award I received from The Joffrey Ballet. My mother had been diagnosed with breast cancer back in 2012 and I was working through that along with struggling to find work as a performer, and also trying to get better as a choreographer. So I took how I was feeling and created a ballet which later became a larger project. Essentially the project came out of lack of opportunity and an opportunity to help fill a gap that felt was missing in the ballet world. The Black Iris Project also aims to bring more minorities to appreciate ballet and the arts as well as push boundaries on the types of stories that are told through classical ballet. How did Madiba come together? I started doing a lot of research on various black composers, musicians, visual artists, writers, costume designers, as well as the stories I could tell through movement. I wanted to know who was out there and see who's work and lives sparked my interest. One day I stumbled upon an article about a new piece of classical music that had been composed about Nelson Mandela's life entitled Madiba that had just premiered at Carnegie Hall—it sent shockwaves through my body. I prayed that the composer was black and that I would like the music. I looked up the composer, Carman Moore, who was indeed black, and I immediately wrote him and asked if I could meet with him to hear the music. He graciously welcomed me into his home to have a listen, and as I started to hear the piece, that shockwave feeling came back again. I told him about my idea of what I wanted to do and before I knew it he was on board. So I then started researching and learning more about Nelson Mandela—when I started I really didn't know very much about him—and two years later, we'll be presenting this ballet at the Kennedy Center. What?! I'm so humbled and grateful for this dream come true. Are there more people of color entering the world of ballet? Has the ballet world been traditionally accepting of more diverse dancers and choreographers? If not, why? Social media has been a wonderful tool for visibility as well as for connecting dancers of color during various stages of their training for inspiration and conversation. This is very different from when I was in school. I had to go to the public library to check out video cassette tapes of dancers and performances. We didn't have YouTube or Instagram or any of that. So the resources make the accessibility and inspiration that much greater. Not to mention figures like Misty Copeland, Eric Underwood, Michaela DePrince—they're often in the news so it helps other kids say, ‘Hey, they look like me so maybe I can do that too.’ And that's always wonderful to see. Yes, the ballet world in general has often seemed hesitant to accept more black dancers professionally, and especially choreographers. As to the reason why? I think it all boils down to ideas on class and race. Ballet is often seen as being such an elitist art form. It started out as being something only kings and royalty did. So it's often been seen as a segregated art form that has been culturally passed down. But when you're growing up as a black dancer in that type of environment it can be very challenging mentally. So in a sense, the bullying I experienced from P.E. to dance doesn't just go away when you step inside the dance studio. A lot of times the "bullying" also comes from inside it. But I believe that it's the freeing qualities of artistic expression, and the love of the art form, that keeps dancers that face challenges such as mine from giving up on their dreams. This might sound like a naïve question, but are there a lot of queer men in ballet? Is it harder to make it in ballet, do you think, if you are queer? Even though ballet is so strict and requires a massive amount of discipline, it still has its creatively freeing properties which I believe attracts queer men. The arts in general are known for being so liberating and expressive and I know that there are many men like myself who have found ballet and dance to be a safe haven. Do I know if there are more gay or straight men in ballet? I definitely won't attempt to answer that. I've encountered a number of both in the ballet world so it's hard to share what a percentage might look like. But I will say dance in general is just more of a safer space for gay men to feel comfortable to express themselves and be vulnerable. Masculinity is often the subject of scrutiny not only in ballet but in many aspects of the performing arts. But as actors, which is essentially what a dancer is, we learn to play lots of different roles and wear lots of different hats. I casually have some effeminate tendencies and believe that that at various parts in my career, people have looked at me and said, ‘But is it believable that he could play that character?’ So that has been a challenge. But really good actors can play just about anything. And I've had some opportunities in my career to really step outside of my comfort zone and play roles that others might be surprised that I have played. Also, women outnumber men greatly in ballet, so it's generally easier for a male (regardless of their sexual orientation) to have a ballet career just because strong men generally are in high demand to partner with women. What do you think is something unique that queer men of color have to offer ballet? Our diversity and our stories. I was chatting with some of my students recently about the role that art serves in society when I found this quote: "Art is not a mirror held up to reality but a hammer with which to shape it." We live in a country that is comprised of so many varieties of people in terms of shapes, sizes, color, ethnic backgrounds, spiritual beliefs, etc., and I believe that it is the duty of art to reflect not only the past and present, but also help shape the future and bring about equality. Ballet Across America will run from April 17 through April 23 at the Kennedy Center Opera House—for tickets, click here.